Events / Book talks are now underway! Join us for a book talk near you! Author Heather Vogel Frederick, who heads up Longyear’s Research & Publications team, will share inspiring stories of the men and women who served on Mrs. Eddy’s staff between 1908 and 1910. From all walks of life, these were ordinary people in extraordinary circumstances, invited to join one of the most mentally active, high-profile households in the world: The home of the Discoverer, Founder, and Leader of Christian Science. 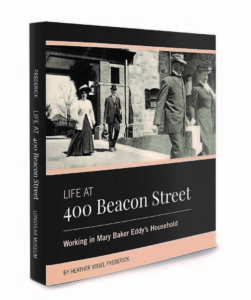 Heather will also relate some of the surprising discoveries that came to light during the research process, and share insights about the important work that Mary Baker Eddy completed during her three fruitful years at Chestnut Hill. A book signing will follow the talk (which lasts about an hour). Copies of the book will be available for purchase, and can always be ordered on our online store (click here to order a copy). We look forward to seeing you there! Throughout 2019, Longyear will be traveling to major cities across the United States to share these book talks. The current schedule is listed below. Additional dates and venues are being added, so please check back if you don’t see your city in the lineup today — and stay tuned for possible webinar dates!